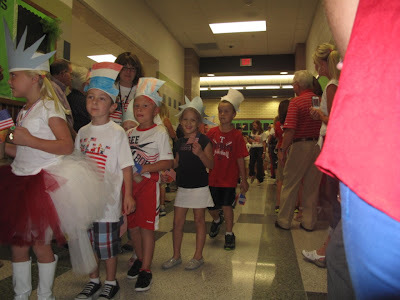 Silly Mommy : Patriotic Parade! On September 11th, the younger girls school had a Patriotic Assembly and an awesome parade! The kids all dressed in red, white & blue, got their hair sprayed different colors(Ella & Cali chose silver which ended up looking gray...and the next day was school pictures and Cali's wouldn't come out all the way! Hahaha. Just got the pics back and you can see a hint of gray in her hair, oh wellsie), and marched down the hallways with the drumline from the highschool. It was so cute and so fun. Joey took an extra long lunch to be able to attend with me(I wouldn't have been able to without him helping) It was probably our first major outing with the baby in tow. And we survived it. I love how this school shows patriotism! The assembly had a moment of silence for the Sept 11 victims and their families. 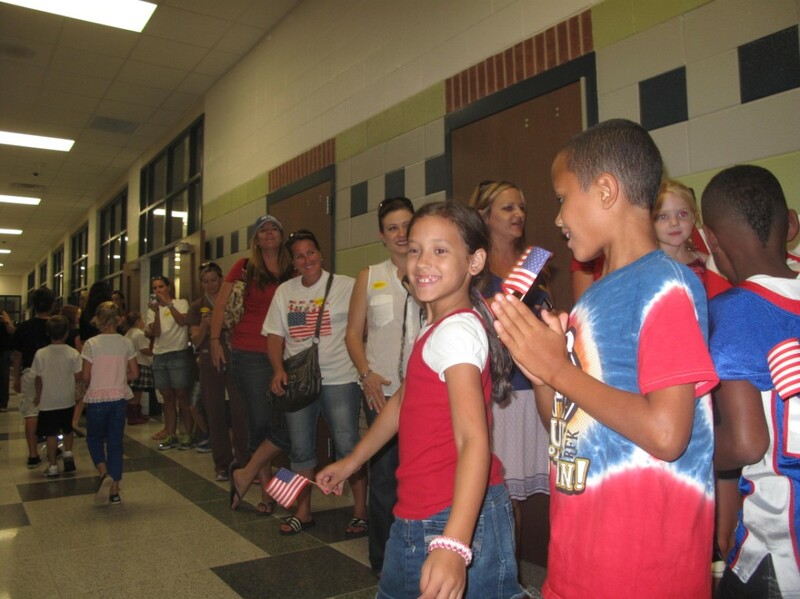 Speeches by the Principal and Veterans were given and a slideshow was presented of family members of elementary school kids who have served our country. The kids also sang patriotic songs. It was awesome. I love this country! We are so blessed to live in such a great nation. I'm grateful to those who give everything, sometimes their lives, to protect it.